I was very happy to receive my ice cream of the month club shipment the other day. It came on Saturday so I was able to save it from the outdoors, check the contents and then throw it in the deep freezer as soon as it arrived. As always, there are four choices every month (usually pint sized choices). From my brief experience, they tend to be from Midwestern companies which is cool since it's all stuff I would never get to try normally. I've been debating which one to try first, but as the day progressed I knew a simple plain chocolate would be the way to get back into AICC. I was in the mood for some chocolate the other day, so I had no problem scooping two servings out of this little Schoep's pint and giving it a thorough tasting. It took a few bites, but I know exactly how to describe this flavor. Now, I don't know how this happens, but have you ever noticed how the single scoop of chocolate ice cream they serve you in a restaurant always tastes the same? That is exactly how this tastes. Fairly creamy, yet with a bit of, i don't know, shall we call it crunch? No, crunch seems like a bad choice, but do you know what I mean? It's a bit solid (but I don't mean dense). The ingredient list actually has high fructose corn syrup in it instead of regular sugar, maybe that's what gives the texture a little chutzpa to it. Ok, I don't really know why I choose that word, but too late, it's there now. The flavor itself is fine. Sure, it's not the end all, be all, but it's definitely enjoyable and I had no problem quickly devouring half a pint of " Wisconsin's Finest ". It's a standard chocolate flavor, nothing fancy or out of the ordinary. What more can I say? 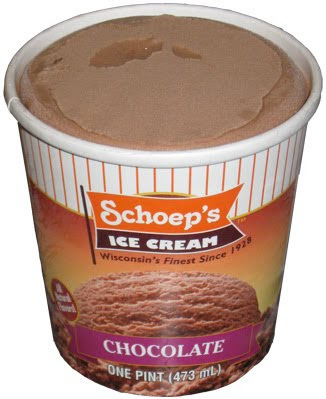 Overall, I enjoyed my bowl of Schoep's chocolate ice cream. I've had better, but I've had much worse. I guess the biggest surprise is the use of high fructose corn syrup. It's funny because the side of the container says "made from original family recipes" which date back to 1928. Well, if that's true, then how do they explain the high fructose corn syrup which wasn't really "invented" until 1957? Yes, I'm starting to rant, it's just that I get offended when the term "finest ingredients" is used to describe HFCS, it just seems wrong.